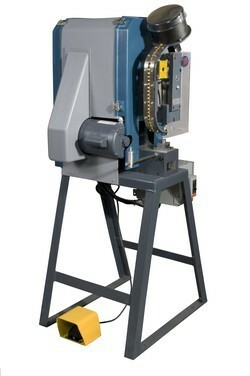 The Edward Segal Inc. Model 2KGW is a fully automatic grommet machine that punches a hole in the material and feeds and attaches both the grommet and washer, all in a single cycle. This machine is built around a frame that requires less space and is much lighter than previous generations of machines. The 2KGW has been specifically engineered for light to medium duty applications. · Bench: 18" x 22" x 32"
· On Stand: 24" x 24" x 64"
· Bench: 375 / 400 lbs. · On Stand: 525 / 625 lbs.